Leucine, isoleucine and valine are three branched chain amino acids side belong to the essential amino acids, ie those which the body itself can not be synthesized and must receive them from the outside with food. In addition to leucine, isoleucine and valine for amino acids also include phenylalanine, methionine, tryptophan, threonine and lysine, but the first three (leucine, isoleucine and valine) constitute 40% of the daily requirements of essential amino acids. The recommended intake of leucine is 40 mg / kg of body weight per day, and isoleucine and valine is in the range of 10-30 mg / kg of body weight per day. 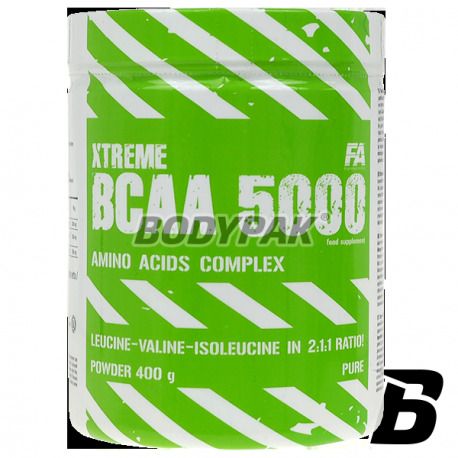 In order to meet the needs of the FA Engineered Nutrition has created a new form of the product based on amino acids BCAA - BCAA product Xtreme 5000. 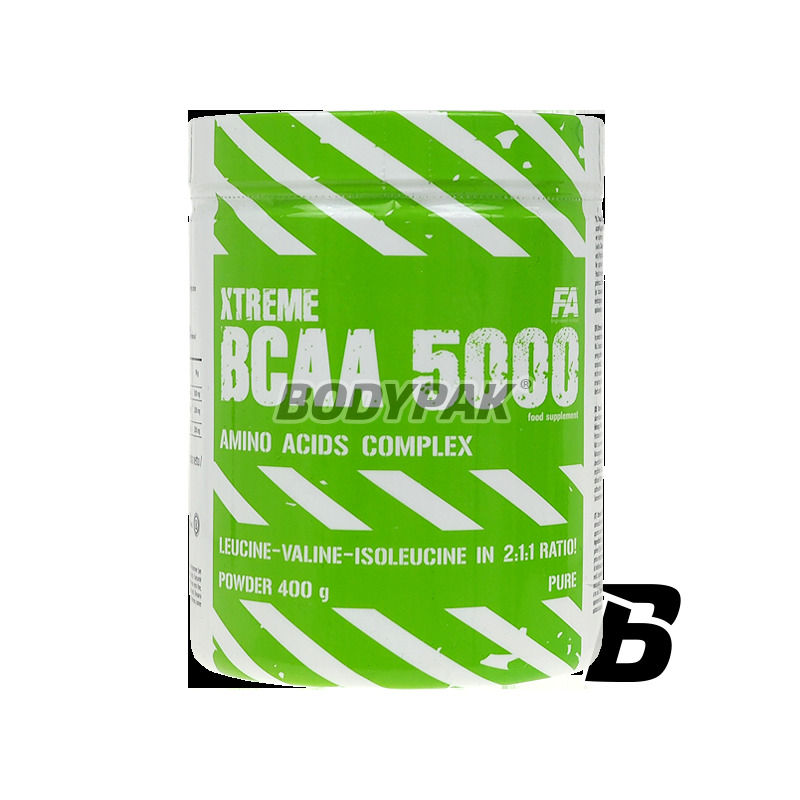 Xtreme BCAA 5000 are a new product amino acid in a powder form for preparation of the beverage, which in each portion provides 5 grams of the highest quality necessary for the body of amino acids with branched side chains BCAA (leucine, isoleucine, valine) in the most preferred for the body 2: 1 1. Under physiological conditions, branched chain amino acids side: leucine, isoleucine and valine are essential for the functioning of muscles during training, affect the stimulation of anabolic processes, inhibition of catabolism and most importantly a source of energy for working muscles. To perform basic life functions but also to the intense exercise the body uses ATP molecule as an energy source produced by oxidation of glucose. With the decrease of the amount of glycogen stored in the form of glucose to working muscles also decreases the amount of ATP - high-energy particles constituting the body "paliwoenergetyczne." After the exhaustion of glycogen levels of ATP in the muscle the body attempts to maintain through the degradation of BCAA and the distribution of fatty acids. Depending on the intensity of the workout BCAA use as an energy source comprises from 3-18%. Due to the fact that most of the amino acids in the natural conditions in the body in a bound form (bound 75% of leucine in the muscle), the pool of free amino acids that may constitute a source of energy is negligible resulting in that the body begins muscle catabolism to provide the working body energy intensive. The effect of muscle tissue degeneration is a release of free amino acids that can be used in oxidative processes as energy source for the body. BCAA represent approx. 35% of muscle mass, and they mainly provide the body with energy during prolonged and intense exercise. The longer and more intense physical exercise, the more of leucine, isoleucine and valine is metabolised. Leucine can be oxidized in the muscles for energy or converted to alanine and glutamine which in turn can be converted into glucose, which will be a source of energy in the bloodstream. Another two isoleucine and leucine can be converted using the dehydrogenase oxo-keto acids, which are further used as starting materials in the Krebs cycle (one of the stages of cellular respiration process) for producing the ATP, the "particle energy". Activity BCAA is not limited only to inhibit catabolism. An important factor is also the stimulation of anabolic - muscle synthesis. Leucine and glutamine are the lights muscle synthesis in the body. High levels of leucine directly strongly stimulates insulin secretion hormone potent anabolic activity resulting in increased assimilation of amino acids in the BCAA (increased protein synthesis), and inhibition of catabolic processes in the muscle tissue. Given the stimulation of anabolism and the fact that amino acids by BCAA reduced the level of accumulation of lactic acid in the muscle tissue regeneration and reconstruction after training it is much more effective. Additionally, BCAA reduces the accumulation of tryptophan in nervous tissue, which has the advantage that tryptophan increases serotonin levels and this in turn is responsible for the fatigue and weariness. By limiting secretion of serotonin the body to allow for longer and more intensive training with no signs of fatigue. Given the above, supplementation product Xtreme BCAA 5000, which provides 5 g of free amino acids that do not need digestion and directly after swallowing absorbed and available blood system to the trainees muscles, which effectively recruits free amino acids and may inhibit the catabolism of muscle tissue and the thus help achieve the effect of which is to gain and not loss of muscle tissue. Składniki: L-leucyna, L-izoleucyna, L-walina, aromaty**, regulator kwasowości (kwas cytrynowy)**, barwnik (E150c)8,7, koncentrat soku buraczanego2,5,6,10, substancje słodzące (sukraloza, acesulfam K)**, barwniki [E160a1,2,4,9,11, (E102***, E133)9,11, E1043***]. *Dotyczy tylko wersji bezsmakowej produktu. **Dotyczy tylko wersji smakowych produktu. ***E102, E104 - Może wywierać szkodliwy wpływ na aktywność i skupienie uwagi u dzieci. Niezła cena.Smak żurawina oraz rozuszczalność super.Jesli dodac do dawki potreningowej l-glutamine to wychodzi z tego superregenerator.Polecam. Jestem zdziwiony tym że smak jest naprawdę dobry bo jak narazie żadne bcaa mi nie smakowało a te jest ok.
Bardzo dobra, cena, rozpuszczalność i regeneracja niestety co do smaku jest już troszkę gorzej, o ile pomarańcz jest dobrym smakiem, tak kaktus jest nie do przełknięcia bynajmniej dla mnie. Znakomita regeneracja, świetnie się rozpuszcza, smakowo używam cytrynę i jest ok. Gorąco polecam!! Klasyczne BCAA w proporcji 2:1:1 - dobre w smaku i o odpowiedniej rozpuszczalności. Żadnych minusów, tylko stosować!